One of the best things about owning a cat is their curious and playful nature. According to the experts, cats that are kept mentally stimulated lead longer and healthier lives. Play is a vital activity for cat. Cats are athletic creatures with amazing strength and agility. Nature made them into perfect machines for leaping, jumping, and dashing. Just because your house kitty doesn’t have real prey to chase doesn’t mean she can’t act out her inner predator. Cat toys and regular playtime are part of providing your cat with a stimulating environment, which makes for a happy and healthy cat. Play gives them an outlet for their energy, mental and physical stimulation, the opportunity to satisfy their instinctual hunting drive, and a chance to bond with you. Cats have an instinctual desire to watch cracks and crevices, especially when they know that something is hiding just beyond their sight. The Peek-and-Play Toy Box is designed to build on your cat’s instinct by partially hiding some of your cat’s favorite toys, and your cat will go crazy fishing them out! Peek-and-Play is especially great for those times when you have to leave your cat home alone, because this toy will keep your cat occupied for hours. Cats are also experts at amusing themselves. It takes very little a crumpled ball of paper, a pen left on a desktop, a newspaper spread open on the floor to engage your kitty in what, to her, is the most fascinating of games. Your cat’s imagination can turn almost anything into a wonderful toy that she’ll bat around or chase to her heart’s content. 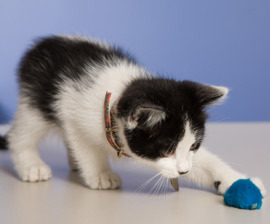 Typically, cats most enjoy playing with small, light objects that are “flickable,” such as a cork or a Ping-Pong ball, which they can swat and then chase. Cats also love empty paper bagsto investigate and “hide” in. Empty cardboard boxes are also popular with cats.